To filter the cards on a board, select the magnifying glass icon. This will bring up the keyboard where you can enter your filter criteria and then press "Done" to apply the filter. 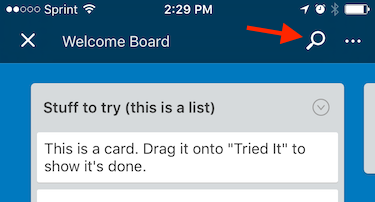 Click the bar above the keyboard to auto-fill members, labels, or due dates. You can filter by a single term or by multiple terms. 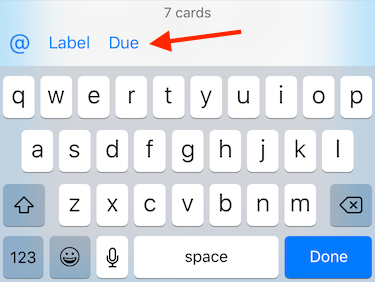 For example, cards assigned to a member that are due in the next month or cards with the green label that have "project" in the title. To exit the filter mode on your board select the "X" that is to the right of the filter input field.